Providing direct support to professional artists that have suffered losses impacting their capacity to make a living in Puerto Rico. Promoting opportunities for professional Puerto Rican artists from the island to tour and present their work in Chicago, in collaboration with artists from the diaspora. Apoyo directo a artistas profesionales que han sufrido pérdidas que afectan su capacidad de ganarse la vida en Puerto Rico. Oportunidades para que artistas profesionales puertorriqueños visiten y presenten su trabajo en Chicago y otras ciudades de Estados Unidos en colaboración con la diáspora. After loosing his life project of La Junta to Hurricane María, the magical space in la Calle Loíza, Santurce where generes like jazz, bomba, and plena where kept alive, Tito Matos is invited to Chicago by the Segundo Ruiz Belvis Cultural Center. This video tells the story of our pre-María visit to La Junta and how the performance last April 19th at SRBCC with Tito Matos y La Máquina Insular allowed the Chicago community to give back to their teacher. As always, it was an honor to work with Tito Matos again and bring his plena to Segundo Ruiz Belvis Cultural Center and The 24th Annual Pa’lante Conference at UIC. We will continue to support Puerto Rican arts in these times of need through collaborations in Chicago and direct support on the Island. We give special thanks to The Chicago Community Trust and the generous individual donors to the Chicago Hurricane Aid for Puerto Rican Arts at SRBCC. Fue un verdadero honor trabajar con Tito Matos y traer su plena al Centro Cultural Segundo Ruiz Belvis. Continuaremos apoyando las artes puertorriqueñas en estos tiempos de necesidad a través de colaboraciones en Chicago y apoyo directo en la isla. Queremos agradecer especialmente al Chicago Community Trust y los donantes individuales del Chicago Hurricane Aid for Puerto Rican Arts en Ruiz Belvis. Luis Rodríguez Sánchez – $1600 for the mastering of the album “Amor es” (Humacao, Puerto Rico). Instituto de Subcultura / Santurce es Ley – $5,000 to support the first energy-independent solar art gallery in Puerto Rico. Compañía de Teatro Y No Había Luz – $8,000 for two presentations in Barrio Mariana, (Humacao) and Barrio Bartolo (Castañer de Lares, Puerto Rico) and to support the Chicago debut of their exhibit “El Circo de la Ausencia”. Compañía de Teatro Agua Sol y Sereno – $3,000 for two presentations in underserved communities in Toa Alta and Juncos. Tito Matos y la Máquina Insular – $6,500 to present La Máquina Insular at Segundo Ruiz Belvis Cultural Center in Chicago and the 24th Annual Pa’lante Conference. Meet Luis Rodríguez Sánchez, musician/composer from Barrio Mariana 2, Humacao, Puerto Rico. He lost his studio to flooding and mold after María. That didn’t stop him from becoming instrumental in the development of Proyecto de Apoyo Mutuo Mariana, where he joined forces with other community leaders to feed 300 people per day during the height of the Post-María emergency. 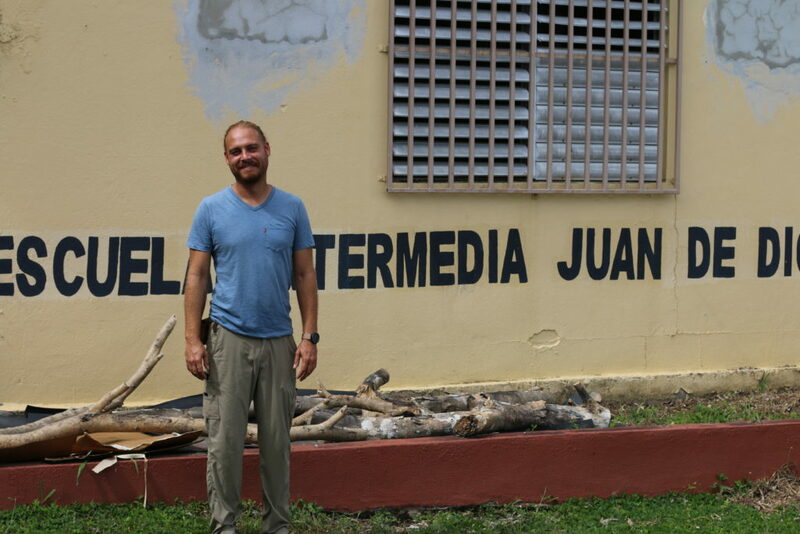 While Luis is one of many in the island that are still without power, he’s currently spending his days rehabilitating an abandoned school to host international volunteers in Mariana. On January 7, 2018 SRBCC director Omar Torres-Kortright went to Mariana to present him with a check for the mastering of his CD titled “Amor es”. This amazing project was put on hold so that he could dedicate his time to the hundreds of people that depended on him. Now “Amor es” is finally scheduled to be released next month. Les presentamos a Luis Rodríguez Sánchez, músico y compositor del Barrio Mariana 2, Humacao, Puerto Rico. Perdió su estudio por inundaciones durante el huracán María. Eso no le impidió ser instrumental en el desarrollo del Proyecto de Apoyo Mutuo del Barrio Mariana, donde unió fuerzas con otros líderes de la comunidad para alimentar a 300 personas por día durante el peor momento de la crisis Post-María. A pesar de que Luis es uno de los muchos en la isla que todavía no tiene electricidad, actualmente pasa sus días rehabilitando una escuela abandonada para recibir voluntarios internacionales en Mariana. El 7 de enero de 2018 el director de SRBCC, Omar Torres-Kortright, fue a Mariana para presentarle un cheque para cubrir los gastos de masterización de su CD titulado “Amor es”. Este excelente proyecto se suspendió para poder dedicar su tiempo a los cientos de personas que dependían de él. Ahora “Amor es” finalmente está listo para ser lanzado el próximo mes. During the height of the emergency, we partnered with the Y No Había Luz Theater Company and Agua Sol y Sereno to support a series of presentations in communities affected by Hurricanes Irma and María in Puerto Rico. Y No Había Luz: Visita al Barrio Bartolo from Y No Había Luz on Vimeo. Our fund continues to support local artists in Puerto Rico, including Y No Había Luz, Agua Sol y Sereno, Instituto de Subcultura (Santurce es Ley) , Luis Rodríguez, Teatro Breve, Tito Matos y la Máquina Insular and many more to be announced in the coming weeks. Additional donations collected at our October 2017 gala have brought the total amount of the fund to $30,000. We want to do a lot more with your help. Now we’re ready to get to work and start making our first investments. We’re also beyond thrilled to be selected for the second year in a row to receive the Strengthening Artistic and Cultural Diversity Grant of the Chicago Community Trust. CCT will be funding with an additional $30,000 a series of SRBCC-curated events featuring touring and local Puerto Rican artists throughout 2018.